it seems i can't find a minute lately to blog. my to do lists have been longer than usual lately and typing up a post seems to end up last on that list. sorry people. today was an early day at the office, so i decided to make this post a priority. wanted to share a fun fudge recipe. while the flavor is just your classic vanilla, the color is what makes these fab. you could whip these up in any color to fit the holiday you're celebrating. 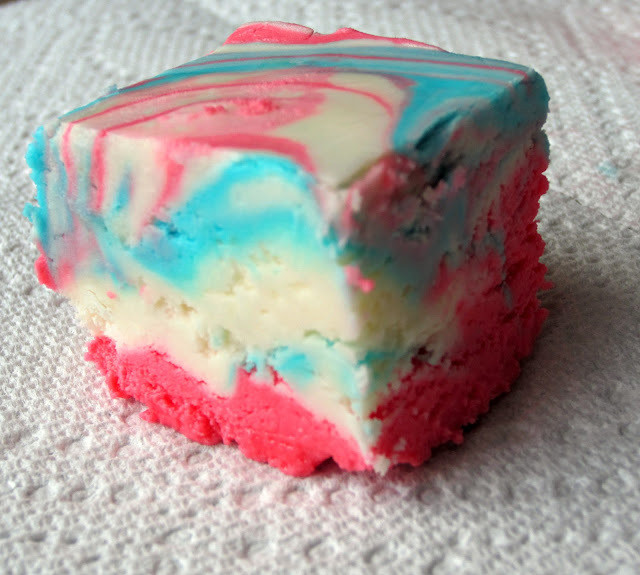 i made this batch for the 4th of july (yeah, the color is a little more pink than red, oops!) but you could switch it up and do black/orange for halloween, green/gold for patty's day.... you get the idea. without any further ado... tie dye vanilla fudge! Line a baking dish with foil. Spray the foil with non-stick cooking spray. Set aside. In a large pot, combine the sugar, butter and evaporated milk. Cook over medium heat, stirring frequently. When it comes to a boil, stir constantly for 5 minutes. Add in the marshmallow creme and the white chocolate chips. Stir until smooth. Divide the mixture into 3 bowls. Tint one red, one blue, and keep the third white. 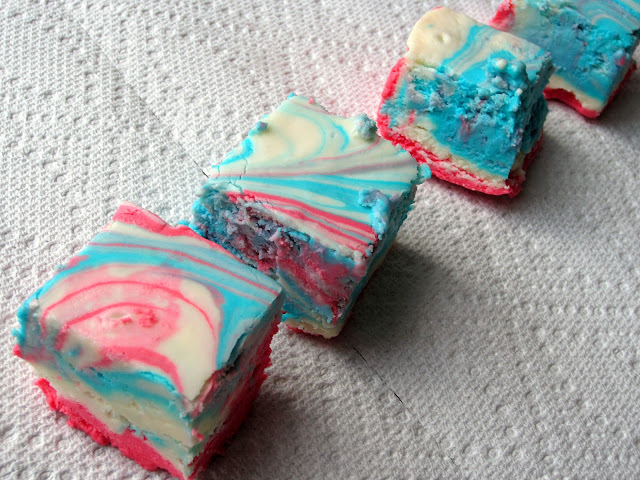 Pour the red fudge into the prepared baking dish, followed by the white fudge, then the blue fudge. 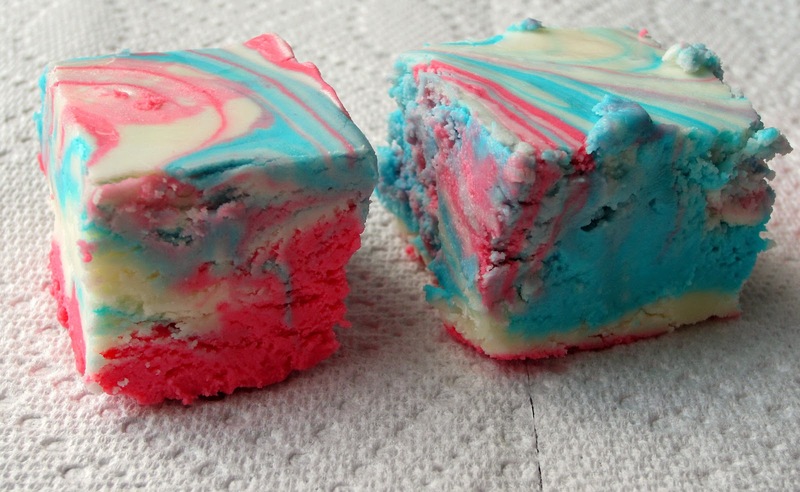 Use a knife to drag through the mixture, combining to form the marbled effect. Let cool completely before cutting. That's all for now. Promise not to disappear again! Have any fancy fudge recipes I should know about? Leave me some comment love. Pleasse? Me thanks you. I LOVE FUDGE! Any time, any where, any color as long as it is incredibly smooth and melts in my mouth. I was in Vermont 2 yrs. ago and had this to-die-for maple walnut fudge made with freshly made maple syrup. I've tried to find the recipe, tried a few recipes that claimed to be the same... but alas no luck. 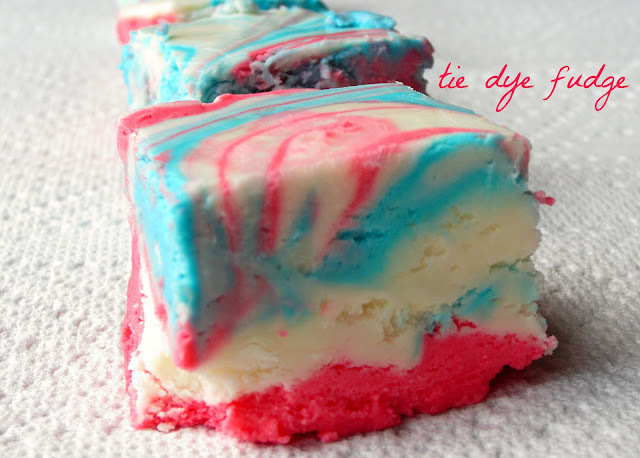 Any suggestions since this tie-dyed one sounds good and looks so cute. Thanks!